Just a quick link here to a WSJ article by Terry Teachout. The article discusses the history of the final artistic efforts of masters who are about to pass away, and know it. Mr. Teachout writes about the differences in creating a masterpiece (such as writing, painting) versus performing a masterpiece (music, acting), and he touches on the possible reasons why there hasn’t been more efforts to provide one, final triumph. A very interesting article, especially in noting the examples he provided. In any event, it’s worth a read! Short answer: NO! (And he is referred to on these pages as The Mighty Jeremy Piven). Longer answer: The NY Times has a theater review of David Mamet's Speed-the-Plow, currently running on Broadway. In the article, the author notes how Piven recently left the show early, breaking his contract, and how the producers have filed a grievance. In the meantime, the show has run with two replacements: Norbert Butz and William H. Macy (a legend in his own right!). I found this article interesting because of how the author perceived the play differently, based on who was cast in the central role. In particular, he cites David Mamet's own belief that the actor has virtuallt no role in the creation of a play's character: his/her job is to read the lines the playwright has written. And while each of the three actors who have played Bobby Gould have recited the lines virtually verbatim, they still present in significantly different ways, which impacts the viewer differently on each viewing. I find this to be immensely interesting, particularly because the profession of actor is like a Rubik's Cube to me - a fascinating puzzle I will never come close to solving. On the one hand, learning lines, understanding motivation, etc. appear to me to fairly straightforward. However, I also apreciate that the best actors bring something else, something difficult to quantify or define, that delivers much more than the lines on the paper. Maybe because I see therapy in a similar light (good therapy: can't technically define it, but I know it when I see it!) that I have such an interest in this idea. Even more interesting from my perspective is that therapists will adopt various roles at various times, all in the service of "moving a client from A to B." There is an awareness of these shifts and motivations as they happen, though a clinician may be hard pressed to describe the mechanisms to the average lay person. My guess is that acting has some of the same subtle initiatives to bring a certain perspective to a character. Then again, maybe I don't know what the heck I'm talking about. In any event, I do find it interesting to compare various portrayals of the same character in peformace art, especially when the source material is generally consistent. This sounds like a temendous experience in terms of seeing three different performances of a great writer's main character, all live, and all fairly close in terms of time. Interesting stuff! 1) This is a really nice write-up about Joe Stafford, who passed away last week. Being one of the unwashed masses, I was unfamiliar with her work. However, Mr. Teachout has once again pointed me in the right direction. 2) Here are some suggestions for interesting classical music composed since 1950. And by interesting, they apparently mean tonal (i.e. tolerable). 3) I also want to give Mr. Teachout a shout out for his recommendation of this two-CD set of the works of Andres Segovia. I bought it based on his recommendation, and I absolutely love it! The CDs contain a range of really wonderful classical guitar pieces, and you cannot beat the price. As I’ve mentioned before, I love the web site About Last Night. I learn so much regarding culture from Terry Teachout and Co. Here, he discusses Arnold Friedman, who he has described as the “greatest artist” you’ve never heard of. In this post, he describes a bit of Friedman’s style, as well as the current thinking by today’s art scene about artists such as Friedman. I freely admit to never having heard of Friedman before, but it is posts like this that make me want to run out and atone for that. I moved back to Denver a little over one year ago, and I have been incredibly happy having done so. One of the things I love about Denver is going downtown. Downtown Denver, for me, is a wonderful place to head on a Friday or Saturday night, with easy access via the light rail, numerous restaurants at which to eat, and a wide variety of activities to entertain. Sometimes I go for a ballgame, and sometimes for some culture. Last night, it was Culture Time! When we returned to Denver, one of the first things my wife and I did, as far as "settling back into the community," was to get a family membership at the Denver Art Museum. Just south and east of the 16th Street Mall, the Museum is only a few blocks from the light rail exit at the convention center. While the regular features of the museum are fine, what my wife and I especially like are the family events (which the kids enjoy), and the special exhibits that are presented for 2-3 months at a time. Last night we had a very pleasant evening. First, dinner at Willie G's, where I sampled the steamed clams in a white wine broth, a huge chunk of medium rare prime rib, and a glass each of pinot grigio (with the clams) and a cabernet (for the rib, of course). Then, it was off to the museum. The Impressionists embodied all of the above. But even these innovative “painters of modern life” were influenced by the art of the past. Explore the relationship between the Impressionists and the Old Masters that inspired them in this beautiful and thought-provoking exhibition, featuring about 100 paintings and drawings from nearly 70 museums and private collections. 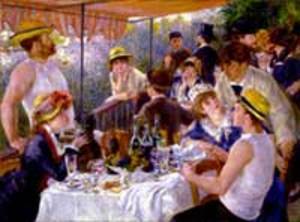 As I'm sure anyone reading this knows, this is Renoir's Luncheon of the Boating Party. I saw this at the Denver Art museum just prior to my moving away four years ago, as part of a temporary exhibit featuring many of the works of The Phillips Collection (based in Washington D.C.). In fact, I saw a collection of paintings assembled in such a way that I was moved, artistically, in a manner I'd never experienced before (at least visually). Prior to that evening, I had wondered, when the subject of art came up, whether 1) people who discussed art in such a way as to convey emotions as I did above were pretentious poseurs, completely full of crap, or 2) something was wrong with me, being a fairly bright individual who nonetheless just didn't "get it." Standing in front of "Luncheon," and some of the works by Cezanne, Van Gogh, Matisse, and countless others, I finally did "get it," and I've made every effort to include visits to museums of art on any trip taken to other cities. Hey, perhaps a post idea has just been born! Back to Renoir. Looking at "Luncheon," I was struck by several things. First, the scale For whatever reason, this had not dawned on me before, the sheer size of that particular endeavor. "Luncheon" is a large painting, and there is no picture or poster that can do it justice. Also, the vividness of the color is impossible to appreciate in a reproduction. In person, "Luncheon" is so...alive. And not just the colors, though it's apparent Renoir used the vibrant colors to convey the sense of vibrancy, but also in the context of the theme - the merriment and joy of life. Young people, enjoying themselves on the river, eating ripe, fresh food, with all of their little stories between them: conversing, engaging, admiring up close or from a distance. You stand there and look at this painting, and you just want to walk into it and join the group. Perhaps in another post, I'll review a few of my other favorites from that fateful trip to the museum. However, back to this exhibit. Overall, I say, "Well done, DAM!" I very much enjoyed my walk through this presentation last night. I have great admiration for those who understand they can learn from those who came before, and this exhibit drove home the point that the Impressionists, by and large, very much admired and respected their forebears, especially painters from France, Italy, and the Netherlands during the previous era. Renoir, Pissaro, Monet, and Degas were prominently featured, as were others, with all sorts of paintings from prior eras. Some of the common themes running through the paintings were landscape scenes, picnic scenes, windmill scenes (with the Dutch obviously being a huge influence here), and studies of the human form. In addition to the similarities (such as subject matter, priorities, etc. ), the differences were also interesting to observe. For example, many of the Impressionists had painted scenes very similar to that of a painting completed long ago, but without the religious imagery. Another difference was the use of color. While the older artists tended to paint in darker hues, with a more somber feel, the Impressionists by contrast would add white, or at least brighter colors and hues, which gave a more lively sensation from observing the painting. The brush strokes were also shorter and more aggressive by the Impressionists, which combined with the lighter colors to make the paintings more lively, as well as more energetic. What is always nice is when you run into a particular piece of art that you are not familiar with, but that you enjoy not only in the moment, but also later, as it lingers with you. One such painting for me was A Young Girl Reading, painted by Jean-Honore Fragonard in 1776. Reading is one of my first loves, so the subject matter is near and dear to my heart, but what struck me about this piece was how, well, Impressionistic it was. 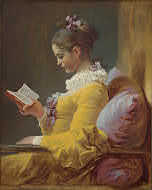 Bright, vibrant use of color (not only the yellow of the dress, but also the hues of the cushion, which aren't apparent from a photo), a simple portrayal of an individual engaged in a simple activity, in a very naturalistic presentation. I enjoyed simply looking at this piece for some time, very pleasant to experience. 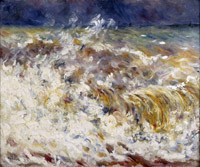 The other painting I was struck by was Renoir's The Wave. Strong, with violent brush strokes, lots of paint, quickly painted, frenetically painted, it has all the energy of a wave crashing onto the beach. Along with reading, the ocean is another early love of mine, so maybe I was drawn to these paintings, at least in part, because they appeal to my sense of subject matter preferences, but I also found them to be interesting (in this case, "The Wave" is so different than most of the other pieces of Renoir's I am familiar with). Again, I can say without reservation I tremendously enjoyed my trip downtown last night, especially my tour of the latest presentation at the Denver Art Museum. I'm actually trying to figure out a way of getting back in there for awhile when we are there next week for a kid's activity day (Legos!). In any event, there are a few other pieces I'd like to comment on from this exhibit, and I will definitely do so if I manage to get back for a bit.